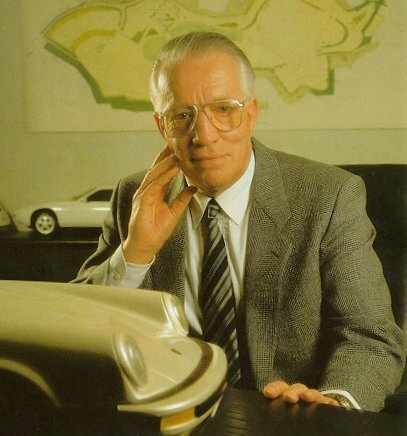 If one were to ask Professor Helmuth Bott, the director of Porsche's research and development division, to name his favorite car, his answer - aside from the fact that he is a keen collector of VW Beetles - would consist of just one three-digit number: "959". The project was officially launched on January 21, 1983 when, at the request of Professor Helmuth Bott, the engineer Manfred Bantle	was appointed as project leader. Bantle took precisely one week to produce an outline specification, setting out the aims of the project in terms dictated solely by technical considerations, regardless of the cost or the work involved. Prior to this, a good deal of thought and discussion had already been devoted to the design of the new vehicle. One of the principal reasons for setting up the project was the situation prevailing at the time in motor mclng, which Porsche had always regarded as having both a pace-making function for technical innovation and a vital significance for the image of its road-going cars. The FIA (Federation Internationale de I'Automobile) in Paris had introduced a revised version of the Group B rules, with the aim of encouraging more manufacturers to participate in motor sport. In Group C, Porsche remained more or less unbeaten for several years: it was only in 1986 that Jaguar succeeded in catching up with the cars from Zuffenhausen. The rules for Group A, stipulating limousine-type dimensions and a production run of at least 5,000 units in twelve consecutive months, made it difficult for Porsche to Group B, however, for which manufacturers were required to build a minimum of 200 identical vehicles, seemed to offer interesting new possibilities. It was to be expected that a considerable number of firms would be sending new and technically advanced vehicles onto the racetrack. As Helmuth Bott commented later, 'One is always wiser after the event. Audi, Lancia, Peugeot, Renault, Leyland, Citroen and Ford switched to rallying with their Group B cars, and the Ferrari GTO will probably never be seen on a racetrack.' However, at the time when the new rules came into force, there seemed to be a great future in store for Group B cars on the racing circuit, and Porsche was ready and willing to take up the challenge. Nevertheless, Helmuth Bott makes no secret of the fact that he would have liked to enter the completed car in at least one 'classic' rally, "just to see what our placing would be'. However, the discussions which took place at Porsche in 1982 and early 1983 were still concerned with the future of the Group B car. 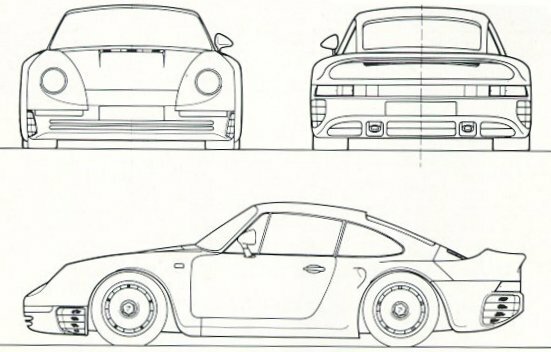 Following the decision to equip the new vehicle with four-wheel drive, the 924/944 and 928 series were eliminated from Porsche's plans:	'If the engine is located at the front and the gearbox at the min	back, then the problem of delivering traction to the front wheels becomes impossible to solve in a way which conforms to our requirements." Only two alternatives remained: either to develop an entirely new vehicle, or to base the Group B car on the 911. And since there was no question of asking the 200 customers to accept a racing car in disguise, Porsche opted for the 911 solution. The plans to build a mid-engined car were therefore dropped. A vehicle of this kind - being little more than a racing car with a road license - would have had several disadvantages. It would have been cramped, noisy, loud and uncomfortable; and for drivers unaccustomed to handling such high-performance cars, its handling would have taken a lot of getting used to. Even if the Executive Board had been able to foresee the customers' enthusiastic reaction to the project, the idea of building a midengined rear-drive car would still have been rejected. However, it was not finally abandoned until mid-1983. While Manfred Bantle and his colleagues were working out a detailed specification in the spring of 1983, carefully examining all the ideas and suggestions to date - following the first project Conference on 21 February with the departmental heads Peter Falk, Hans Mezger,Paul Hensler and Helmuth Bott, all the departments had been officially brought into the decision-making process -- it became clear to all concerned that the 959 represented an ideal testbed for assessing the future of the 911. And at the same time, it became apparent that this, tile oldest series in the Porsche stable, still had a tremendous unexplored potential. The first results of the engineers'calculations began to arrive on the project leader's desk. Copies of the provisional specification were circulated on 8 March 1983, and twelve days later, Helmuth Bott had to say goodbye to one of his most cherished designs. "The C 20 - that was the works name of the car - was a 911 which had been experimentally fitted with four-wheel drive. Since we always try out all sorts of ideas, we had been building occasional examples of the 911 with this form of traction for years, but the C 20 was a particular success. Which, no doubt, was why it was selected for the Paris-Dakar Rally endurance test the following year.' By entering the car in this gruelling desert race, Porsche avoided breaking the rule prohibiting Group B cars from taking part in World Rally Championship events.